First of all, I need to say that I have been working with PCs professionally for the last 12 years of my life so what could seems easy for me could not be in that way for some of you. In another hand, if you break your eo in the process of upgrading it, you just voided the unit warranty. Secondly, it’s going to be a lot easier if you select the HDD size that you need right when you place your order at TabletKiosk. That’s my recommendation, lets the experts do the job for you. After all, TabletKiosk is giving you the opportunity to configure your UMPC in the way you want it, something that no other seller is doing at this moment. After all this said lets go back to the main topic: how to upgrade the HDD of your eo. If you are planning to use your eo as your music companion paired with your iPod or to watch movies you may run out of space sooner than what you think. I ordered mine with a 40 GB HDD spinning at 7200 RPM and after a few weeks of use I found that to use it to hold my 20 GB music collection was just impossible. So suddenly I found myself in front of the task of upgrading my HDD. I knew that TabletKiosk use in mine a Hitachi Travelstar so it was not too hard for me a site selling me one of this HDD with 100 GB capacity and for just 149 dollars, 350 dollars cheaper than if you select this option at TabletKiosk site. 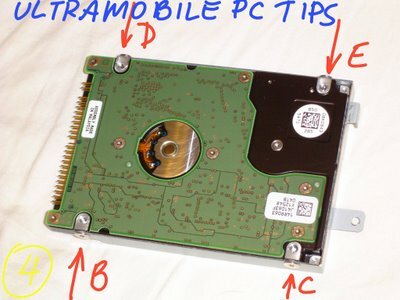 How to copy your old HDD into your new. One of the things I did not want to do was to install everything from 0. 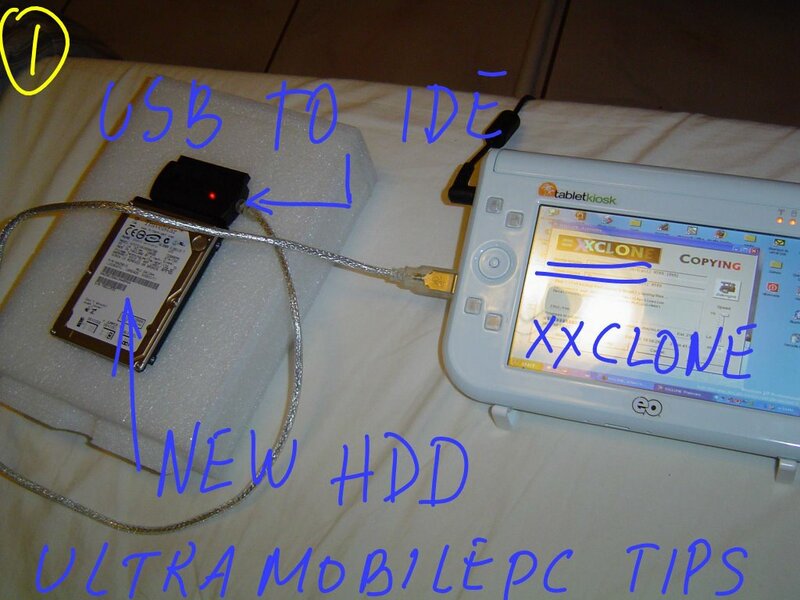 So, after a little bit of research and using a tip, I found that using xxClone, a wonderful freeware, and an USB to IDE adaptor, something that can be bought at eBay for only 20 dollars, a perfect copy of your HDD could be done and even without having to open your eo. A few notes on this point. I found that if the new HDD is not formatted Windows XP is not capable of recognizing the external HDD connected using the USB to IDE adaptor. 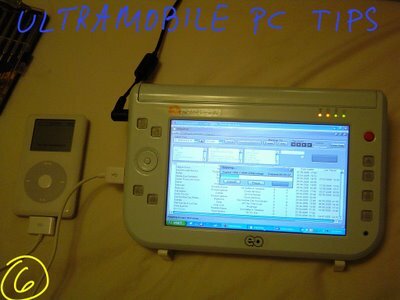 In my case, I have a Compaq nx 9010 with a bay holding the 2.5 inches HDD so it was a very simple task to put the new HDD in that bay, boot the PC using the Windows XP CD and format the HDD. The other thing I found was that for some reason the Outlook pst file was not copied by xxClone and I had to copy it manually once I switched the HDD. 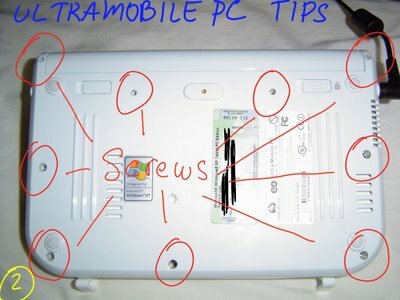 To open the eo is a matter of removing the screws shown in picture 2. Once the screws are removed all you need to do is lift the back cover. Something that can be done with your hands without any tool as usually happens in some electronics. Once the back cover is removed the next step is to remove the screw that holds the HDD to the unit. The screw is marked in picture 3 using the letter A. 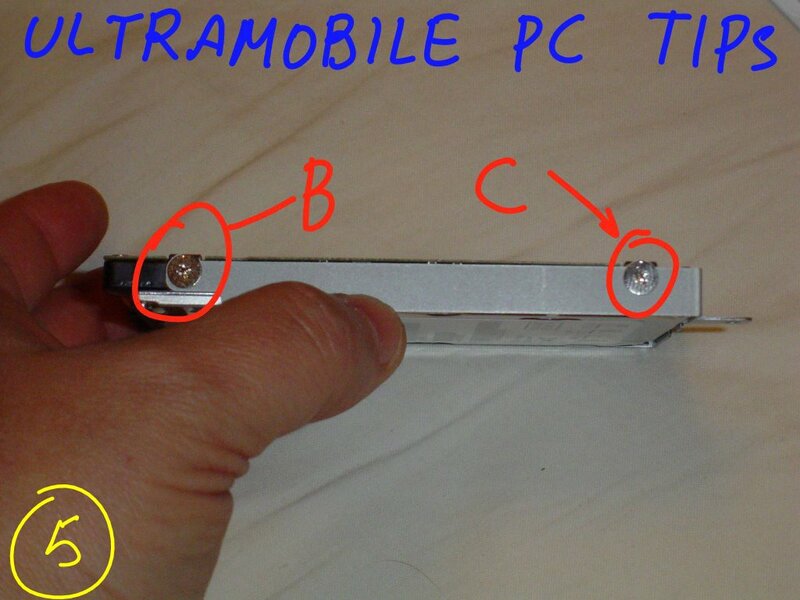 Once the screw is removed push the HDD gently in the direction indicated with a blue arrow in picture 3. After that you have to remove screws B, C, D and E that hold the HDD to a rack as it’s shown in pictures 4 and 5. After that, all that rest to do is to put the new HDD in the place of the old one and put back everything in the way it was before. lf you have done everything correctly after you turn on your eo you will have the perfect pair shown in picture 6 talking to each other in a common language: music. Hope you don't mind if I borrowed one of your pictures for it - I gave you full credit of course. Look here and you will find more about the warranty and what your rights are. I checked your blog today in the morning and [ thought about to post a few lines about it. I'll do it later today or early tomorrow. I've cloned a few drives using ghost in this way when upgrading laptops and a usb-ide cable - is without a doubt the best way. Should mention though, that Partition Magic can recognise the unformatted drive over USB which can then be formatted to NTFS within windows from PM. It's then ready for cloning, without the need to initiate the drive in another system. Hi, thanks for your infomation before I buy it. I am curious that could I upgrade RAM by myself? And how many slots did you see inside eo when you open the case of eo? If I could upgrade both HDD and Ram, I would buy the 256MB Ram and 40gb HDD and upgrade by myself. in picture 3 you can see at the end of the blue arrow the only one memory slot in eo.